Address: Casa Colibri, 3 bedroom 3 bath, Unique & beautiful home with pool and more! 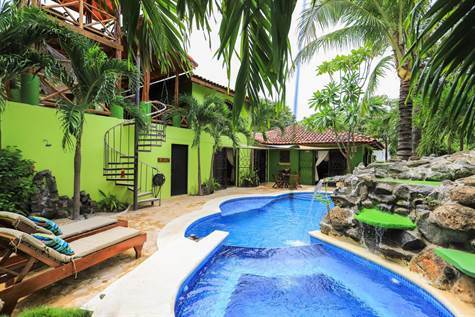 Welcome to Casa Colibri "Humming Bird House", located less than a 3 min walk to the beach and surf in this gorgeous little beach community called Palm Beach Estates, Playa Grande, Costa Rica. There are several great restaurants plus a small grocery store within a short walk of the house as well. Here you will find a plethora of beautiful birds, including humming birds, and can enjoy the comforts of all the modern conveniences in the middle of a nature lovers paradise. This house is the nature lover's dream and caters well to those who love to entertain. The house is fully equipped with cable TV in every room, high speed wireless internet, air conditioned throughout, and much more! The house was fully remodeled in 2015 and is like a brand new house. Featuring 3 spacious bedrooms, and 3 baths, each with en suite baths and closets. The master bedroom has direct access to the pool, plus a spacious loft with a pull out couch, and a quaint desk just in case you need to do a little work during your vacation here. The master bath is complete with double shower heads, and stylish glass shower doors. The kitchen is spacious and well equipped with everything you need for cooking gourmet meals during your vacation, or better yet, contact our concierge and they'll find a private chef to cater for you during your stay! The living room as a full stereo system for you to enjoy, as well as a 41 inch plasma flat screen TV. Adjacent to the living room and kitchen is a formal dining area. One of the coolest features of the home is the roof top terrace, with a bar, and mini fridge and stainless steel BBQ, as well as a birder's lookout tower. It's a great place for entertaining. The managers of Casa Colibri have concierge staff to cater to your every need. They can arrange your airport transportation, as well as arrange all the fun activities you will like to do during your stay. We look forward to hosting you at this truly unique home near the beach. We trust you will have a blast at Casa Colibri. Contact us today for your dates.